St. Clare’s Summer Camp opened for its second year this Summer. The kids enjoyed lots of physical activities such as agility trails, tug of war, athletics, games, football, soccer, bench ball, and to top it all off a Water fight!! Every year in St. Clare’s we try to organise something active and fun for our end of year school tours. Have a look at some of the places we went this year! Thank you to all the teachers for organising such brilliant tours. nature walks, heritage trail, pony rides, tractor tralier rides and hands on farming fun. Climbing, coordination based activities, a high energy Tour! Our Sports day is a huge, annual, all day event. Children walk from the school to the local GAA pitch. The pitch is divided into different activity zones to cater for each different year group and classes rotate around from activity to activity. Activities include races, obstacle courses, games, Tug of War penalty kicks etc. Please click on the link below to have a look at the full list! In St. Clare’s we are lucky to have a walking route around the County Museum called ‘The Nuns Walk’. We have started to use this route this year as a running circuit and all senior classes have participated in a group run. The full route is 2km and is graded as ‘easy’ on the ‘This is Cavan’ website http://www.thisiscavan.ie/fun/go/walking. However, we have modified the route, shortening it to just the museum and church grounds. During the year roadworks were carried out on a section of the ‘Nuns Walk’, so we improvised a new route using the perimeter of the school as a running circuit. The children enjoyed this running initiative as it provided an active break from classwork, especially in the afternoons! We have also introduced the ‘Run around Ireland’ and ‘Run around Europe’ challenges. This was completed over several weeks. Working on the ratio of 1 lap = 1KM or 4 laps = 1km (depending on the year group) the younger children completed shorter distances for example Cavan to Donegal, or Dublin, Galway and Cork. Senior classes had more challenging distances to complete such as London, Paris, Madrid, Berlin, Brussels and Amsterdam. We charted our progress on challenge charts and learned about what tourist attractions these cities had to offer in Geography. This was a great mix of PE, Maths and Geography. During ‘National Walk to School Week’ we invited guest speakers from the Road Safety Authority and from the Cavan Walkers club to come to our school. Emma Clerkin from the RSA gave road safety workshops to all classes in the school. Her workshops focussed on the rules of the road and being safe when out walking. Kathleen Brady from the ‘Cavan Walkers’ club gave a talk to 4th and 5th class on the many benefits of walking and showed us some of her own equipment when she goes on long hikes. She also gave out information leaflets about all the walking routes in Co. Cavan. We also took part in the National WOW day on the 16th of May. The children visited local shops and business’ and met with some of the local business people. The EAL walk was a great way to learn some new words and get in some exercise too! The children went on a lovely, sunny nature walk, identifying all the pretty flowers we have around our school! Mr McCartin hosted our annual Céilí during Seachtain Na Gaelige. The children did some super jigs and reels! Mc McCartin also included a new ‘Floss’ move into the Céilí, much to the delight of everyone in the hall!! On the final day of Active Week, the students dressed up as their favourite sports star. We had hurlers, tennis players, boxers, basketball players, wrestlers and football stars to name just a few! Future stars in the making!! Due to the huge popularity of ‘Tug of War’ last year, Ballinagh Tug of War club came back to St. Clare’s again for Active Week 2018. Christina and Tammie who played for Ireland on the national Tug of War team were fantastic and gave the students some great advice on how to improve their technique. Have a look at some of the photos below! On Wednesday the children finally got their own back in ‘Take on the Teachers Dodgeball’. The stakes were raised even higher with a one night homework pass up for grabs. The teachers took an early lead in the first game, but the students dug deep and with some powerful throws of the ball drubbed the teachers with a 3-1 victory!! We had another great turn-out for our WOW day on Wednesday the 25th of April. Lots of students, parents, teachers and members of the community joined in on the walk. Getting a bit of fresh air and exercise in the morning is great to help with concentration during the day. There is always a very positive, happy mood during WOW days and it’s a great way for the community to get together and have a chat on the way to school! The bad weather didn’t hold us back from our WOW Day last Wednesday. As usual we had a great turnout of students, parents and teachers. We started off our walk from the Percy French Monument in Market Square and were joined by even more pupils and parents on our way. Hopefully the weather will be a little better for our next WOW day! 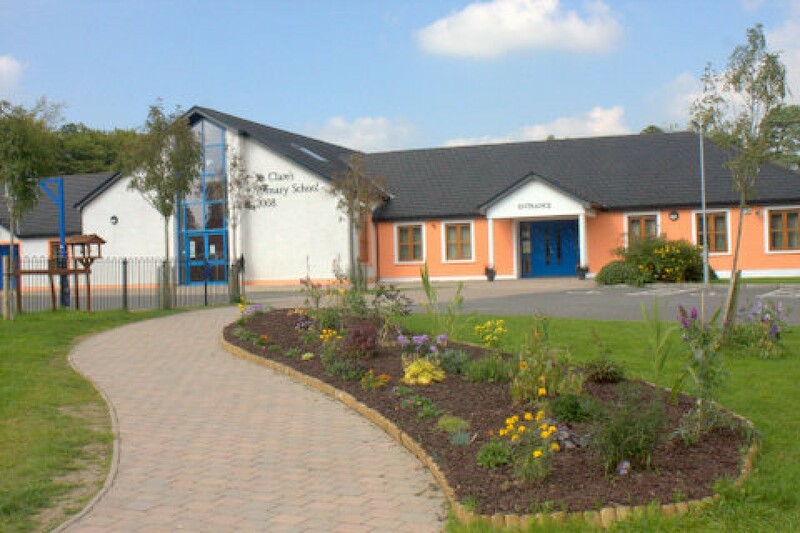 We were very lucky to be selected for a special workshop on Wednesday 7th of February, when Cavan Library Service in collaboration with Cavan Sports Partnership launched the ‘Healthy Ireland at Your Library’ Initiative and offered St. Clare’s NS a free session to our second class students. The children loved doing athletics with coach Sasha! For more information on the initiative and on how you can live a healthier lifestyle please visit Cavan Library’s Website at www.cavanlibrary.ie or visithttp://www.healthyireland.ie. 5th and 6th Class girls took part in a Camogie Blitz in Kilinkere Leisure Centre over several weekends during the months of January and February. They did extremely well and had great fun competing. Both Ms. Smith and Ms. Fitzpatrick coach the girls after school and they are very proud of them! We are delighted to see the 10@10 back on our screens! Every morning at 10 we get up and get active for 10 minutes, it’s great to start the day with some exercise! 2018 has started with a splash as 5th class have completed a 5 week block of swimming lessons in Cavan swimming pool. We’ve really enjoyed it and hopefully we can put our new skills to good use! Good luck to 4th class who are starting after the midterm break! We had a fantastic response to the women in Sport competition with over 30 entries from 3rd to 6th class. Entries included Katie Taylor, Sonia O’Sullivan, Rena Buckley, Shawn Johnson, Darcey Bussell, Gabby Douglas, Jessica Ennis, Ellie Simmonds, Briege Corkery, Holly Holm, Maya Moore and many, many more. There was a huge selection of different sports including kicking boxing, ballet, basketball, gymnastics, Gaelic football, swimming etc. These women are some of the most hard working and dedicated athletes in their profession, who continue to pave the way for women in sport, providing incredible role models for aspiring young girls and boys across the world. With so many excellent projects to choose from, it was extremely difficult to pick a winner. However Mr McCartin, Mr McTeggart and Ms Sullivan finally agreed on a final 3. In 1st place: Tara McCabe, Ellen McCaul, Caoimhe Conaty and Ava Slowey with their project on GAA Star Briege Corkery. In 2nd place: Kesenija Boronenko and Nicole Isakava with their project on American basketball player Maya Moore. In 3rd place: Jack Rooney, Sean Lovett and Ciaran Caldwell with their project on GAA star Cora Staunton. To find out more about these amazing entries please check out the display board outside the GP room. We are getting active at every opportunity in 4th Class! While learning about 2D shapes we danced along to the song ‘Getting in Shape with 2D shapes”. Whether it was ‘push ups with the hexagon’, ‘sit ups with the oval’ or ‘lunges with the octagon’, we were stretching our bodies and our minds! 3rd and 4th Class took part in a Tug of War Blitz in Stradone Community Centre on Thursday the 14th of December 2017. The Blitz was organised by the Cavan Sports Partnership and The Tug of War Association of Ireland. Lots of other local schools participated in the blitz and the students had some tough competition to beat! We entered 5 teams of 5 students. After battling it out, match after match, our boys’ team put in a magnificent win over St. Felim’s NS in Cavan town and took home the trophy for first place!! We even made it into the local paper ‘The Anglo Celt’!! Take a look at some of the photos from the blitz below. We held our Santa Dash on 20th December and brightened up Ballyjamesduff with all our fabulous Christmas attire. Before we set off, we did a warmup in the hall. Here we are getting all ready for our run!!! Our 6th class playground leaders are back up and running in the infant playground teaching lots of fun new games to the younger children! Friday Fitness Fun is back!! With such big numbers in our school there was not enough room to play with the sports equipment on yard at break times. As a result, last year we decided to use the hall to create a ‘zoned’ area for the students to play. Classes rotated every Friday and this worked really well. This year the students will be delighted to play with some of the new sports equipment such as space hoppers, trampolines and a large Velcro target board!! The following dates are allocated for each class to use the GP room and PE Equipment for Fun Fitness Fridays! Everybody can check below to see when their class is on! 5th Class have had a great time learning the skills needed to be a great Gaelic footballer this December – are we looking at some future All-Ireland winners?!! New P.E. Equipment for St. Clare’s!! Thanks to the fantastic fundraising efforts of last year’s hardworking Student Council, we have been able to make a substantial investment in much-needed P.E. equipment for our school. While the taste of last April’s bake sale treats has been long forgotten, the money raised on that day has made a terrific contribution to our delivery of the P.E. curriculum. Staff and pupils compiled their P.E. equipment wish list and we were delighted to be able to make many of those wishes come true-the wide selection of equipment purchased includes new javelins, beanbags, footballs, training bibs, rugby balls, a Unihoc set, foam balls, soft-toss discs, scooter boards, a tag rugby set, plastic balls, a bowling set, two parachutes and a new pair of Samba goalposts as well! A huge thanks to everyone who supported our Bake Sale in April-we are incredibly grateful to you all. Pictured above with our brand new P.E. resources are the pupils who served on last year’s Student Council so commendably, the ever-enthusiastic members of our Active School Committee who continue to make our school a more active place to be and some of our senior P.E. monitors who ensure that all our P.E. resources are well-maintained throughout the year. We can’t wait to start using our new equipment and we are now looking forward to our action-packed, fun-filled P.E. lessons even more than we usually do! We had our Zombie walk on Friday 27th October. Many ghouls, ghosts and other frightful creatures were spotted walking around St. Clare’s that day. The walk was a great success and the children really enjoyed it and we were accompanied by some parents along the way. Our very own Tinkerwell put a silence spell on everyone just before we left and then we marched off on our spooky journey. It was a spooktacular event!!! !